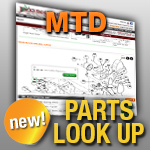 MTD Tires: Have a flat or worn out tire on your MTD lawn mower? Jack's has replacement MTD turf tires, snow blower tires, and other types of tires for your equipment. We also supply MTD Wheels. Select the type of tire you need below.